A Digital Mammogram/3D Tomosynthesis exam is a safe, low-dose x-ray picture of the breast, that aids in early detection of breast cancer. Choice Diagnostic Imaging offers confidence of care, with state-of-the-art technology, featuring our GE Senographe Pristina with 3D Tomography. 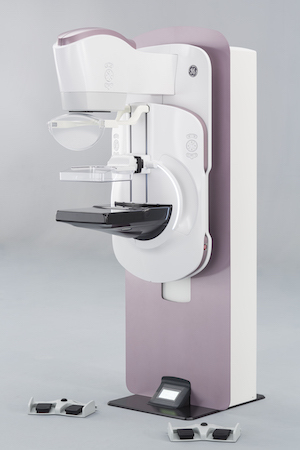 Our Pristina mammography system delivers superior diagnostic accuracy at the same low dose as 2D mammography exam, with the lowest patient dose of all FDA approved digital Breast Tomosynthesis systems. Digital mammography with CAD is different from conventional mammography in how the image of the breast is viewed and, more importantly, how the image is manipulated. Digital mammography allows the radiologist to magnify images, increase or decrease contrast and invert the black and white values while reading the images. These features allow the radiologist to evaluate micro-calcifications and focus on areas of concern. Computer-aided detection (CAD) From a digitally acquired image, the CAD software then searches for abnormal areas of mass, density, or calcification that may indicate the presence of cancer. With CAD systems, radiologists have a means to overcome the known limitations of human interpretation of mammograms. Studies have shown that CAD significantly increases radiologist sensitivity for the detection of breast cancer. Choice Diagnostic Imaging offers a full range of diagnostic services which allows us to provide any additional follow-up testing that may be required, usually the same day! Also, don’t forget to schedule your next annual screening with us prior to leaving our office!